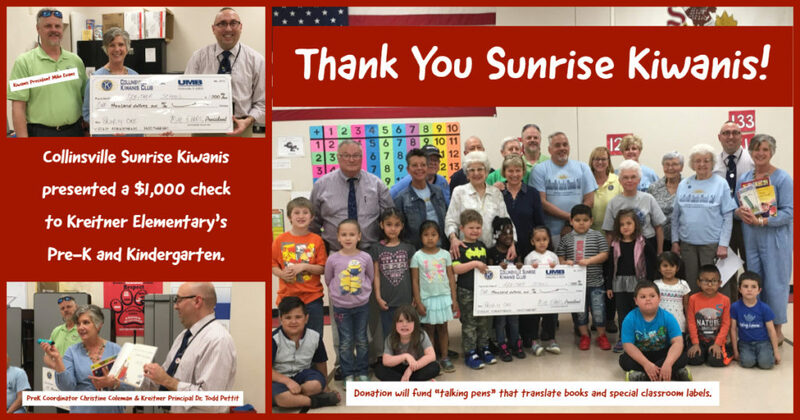 On April 11, 2019, Collinsville Sunrise Kiwanis, Collinsville IL presented a $1,000 check to the Pre-K and Kindergarten programs at Kreitner Elementary School. Sunrise Kiwanis President Mike Evans gave the check to Collinsville Pre-K Coordinator Christine Coleman and Kreitner Principal Dr. Todd Pettit. The donation will be used to purchase “talking pens” and special books they translate. Mrs. Coleman and Dr. Pettit demonstrated the pens for the children and Kiwanis members in attendance. Collinsville’s Kiwanis Club works tirelessly to raise money for kids in our community. Young Children Priority One is an ongoing service project of Kiwanis International that addresses the needs of children age 0-5.